Metaphysical musings of author/illustrator and pet portrait artist Connie Bowen, author of "I Believe In Me," the beloved children's book of affirmations. I'll never forget that evening. It was several years ago. The warm summer evening was just right for a festive night out to a new Mexican restaurant. We pulled into the parking lot adjacent to the restaurant, hoping for a spot. We were right on time for our reservations for a party of five - a gala evening of celebration with my husband, Mike, whose parents were visiting from out of town. The restaurant parking lot was full, but luckily we found a spot quite near the entrance. We swung into our spot and right in front of our car was a sign that said "PARKING - El Ranchito Restaurant" in bright red letters. We counted our lucky stars, said thank you to the Universe for reserving the perfect spot for us and left hurriedly to enjoy our meal. By the time we had finished our sumptuous dinner and made our way back to the car, the sun had long since gone down and the stars were twinkling through the clear evening sky. We settled into our car, the engine roared to life and Mike turned on the headlights. They shown brightly now on the sign six feet in front of us. There, clearly printed in red was "NO PARKING - El Ranchito Restaurant." With the engine idling, we both literally stared and stared at that sign, taking in what we had experienced. How had we both missed the word "NO" so clearly printed on the sign? How had our perceptions altered in such a way as to enable us to see what we wanted to see? Was there actually a shift in reality to allow us to park there? We would have had to drive around quite awhile to find another spot as all the rest were taken. I believe the Universe knew we were safe in parking there and allowed us to do so. I truly love the synchronicity that appears in our lives. It makes me think the Universe is definitely listening! Years ago I gave my husband a gold chain with an open heart dangling from it for his birthday. He loves that gift and still wears it to this day. I knew it was perfect for him when the sales lady at the large dept. store pointed it out, saying “Here is a big, open heart that you might like to choose to add to the gold chain.” My husband is the most generous individual I’ve ever known. He puts others’ needs above his own and will work tirelessly to help anyone in any way he can. “When I was walking back to the office after lunch, a sad, disheveled man approached me walking the other way. He seemed feverishly upset. When I asked him what was wrong, he blurted out “No one in this city has a big, open heart.” I pulled out my necklace from underneath my shirt and smiled, “Oh, yes, they do! And here’s one to prove it!” Startled by the coincidence, the man’s demeanor changed immediately and he walked on, smiling. I marveled at the synchronicity of this encounter. How had it been arranged so perfectly that these two strangers would meet for a just a fleeting moment, yet the encounter would change both of their lives for the better? The secrets of the Universe are indeed a mystery. "Follow your creative whims, they lead you not astray, for as you follow, you will be lead - to the truest bounty - the richest being Love ~"
This year, I've decided to focus on listening to the still, small voice within me and follow my creative whims. 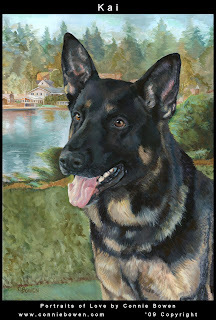 As a pet portrait artist, I had always wanted to paint portraits of the German Shepherd police dogs. They are so regal in their stance - full of confidence and ready to jump into service whenever needed. I called the Lake Oswego, Oregon Police Department, my local police force, and offered to donate such a portrait to their K-9 Corps. What follows is truly a magical story of synchronicity. A year ago, my husband gave me a beautiful, framed new 18x24 canvas for Christmas with the idea that I could paint anything I wanted - no strings attached. I stared at that empty canvas for over a year. Suddenly I decided this would be used for my portrait of Kai, one of the German Shepherds on the force! I made an appointment to take Kai's photo, and in a few days his portrait was completed. While painting, I had the fleeting idea that the local newspaper might like to write a story about the donation I was preparing. The next morning, my mouth dropped open as I stared at an e-mail from one of the newspaper's reporters wishing to write a story about me and my work. When I asked how he had come to contact me, he said one of the other reporters had randomly seen my name on a blog and recommended he write the story. He was thrilled to hear about the painting I was working on. With the painting now complete, I called the Lake Oswego City Hall to arrange for the painting to hang in their permanent collection. I was following each step of my inner guidance as it came to me. My husband was so surprised to hear that I did not have this all arranged before I started the portrait. In no time at all I was connected to Diana at the City who assured me that yes, the painting would hang in their permanent collection. I pictured handing the portrait over to the police officers and snapping a quick photo to commemorate the moment. While waiting to hear back from Kai's handler as to a time when I could drop the painting off, Diana called back to say they were arranging to have me present the portrait at the next City Council meeting and the whole presentation would be televised! By following my highest joy, I know I can tune into the higher, finer vibrations of love, peace and abundance. I am a pet portrait artist and author/illustrator of affirmation books for children. "I Believe In Me" won the national Athena Award for book-as-mentor in the category of spirituality and has sold over 50,000 copies worldwide, including the Spanish edition.